While most riders look to the Dura Ace groupset for the best-of-the-best, but with the R8000 groupset Shimano sought to bring that pro-proven performance to a more affordable price with only a slight weight gain. With a redesigned crankset that pulls the features and technology down from the 9100 level, the FC-R8000 is designed to minimize weight without sacrificing stiffness. With a wider gear pitch, this crankset is designed to fit into a variety of frame styles and geometries.Designed to provide riders with choice without complication, the FC-R8000 is available in standard compact, semi-compact, or cyclocross gearing options, with crankarms from 165mm – 175mm in length. Claimed weights: 681g (52-36t), 674g (50-34t), 668g (46-36t). Redesigned crankset featuring trickle-down tech and design from Dura Ace 9100. Lightweight crankarm design flows seamlessly into 4-bolt spider for optimal stiffness. I considered these cranks as a replacement for my venerable Shimano Dura Ace 7850 Compact cranks. 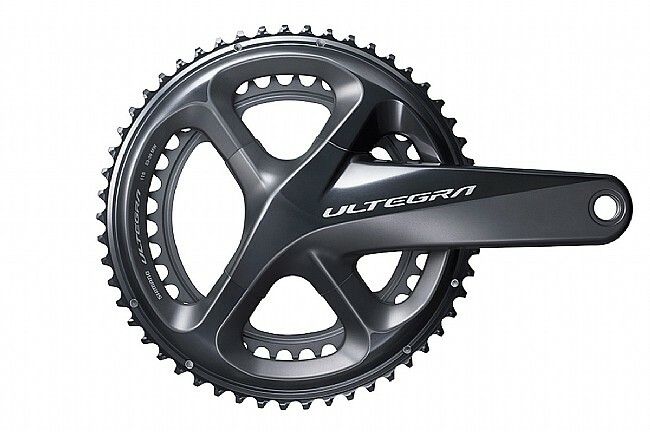 The problem was, I'd worn out the big chainring of my classic 7850 crankset and purchasing a new chainring was more expensive than the full price of the Ultegra modernized upgrade (lighter and stiffer). I was not disappointed...the Ultregra replacement performed flawlessly with my SRAM Red eTap WiFli setup. The front derailleur shifting was noticeably improved, and just as stiff (if not more) than the Dura Ace it replaced. Just goes to show that the Shimano trickle down technology is very real and rewards riders that put lots of miles on their equipment. I bought the 46T36T version to replace a SRAM crankset and was immediately impressed by the improvement in front shifting. Everything else in my SRAM 10-speed drivetrain was unchanged, so the improved shifting can defiinitely be attributed to the Shimano chainrings (which have a reputation for being stiffer than SRAM)...Installation was easy. You'll need a Shimano bottom bracket, but those are cheap and sturdy with good weather-resistant bearing seals. Lastly, the Ultegra 8000 asethetics are mint clean lines, muted dark gray finish. I actually think this crankset looks nicer than its much pricier and only slightly lighter Dura Ace 9100 cousin. Pretty sweet crankset if you race cyclocross. This is my second crankset of this size, I put it on a road bike that I built for my coming tour that involves a lot of climbing. Shimano only made this teeth count combination for Ultegra, but the rest of the group is DuraAce. So far, it perform exceptionally, crisp gear switching and lightweight. The new version (R8000) is good looking too. Maybe a tiny bit less stiff than Dura Ace . But so solid, smooths and ready to go. Snappy in acceleration and spins for days. I am sure that if you are looking to find the difference between this and dura ace you will find it . but you have to really look for it.